Learn how to bake chicken in the oven in three easy steps with my Easy, Crispy Oven Baked Chicken Drumsticks! Simple to whip up and so much healthier than frying, this will be your new go-to for dinner. Growing up fried chicken was always a staple for dinner. I remember how much my grandma loved her fried chicken and mashed potatoes. She’d make it for dinner at least once a month, and the family would come running. What’s not to love? Crispy, crunchy, juicy and flavorful fried chicken is pretty much the bomb diggity of chicken. Unfortunately, fried chicken isn’t exactly the healthiest, though not too bad in moderation. 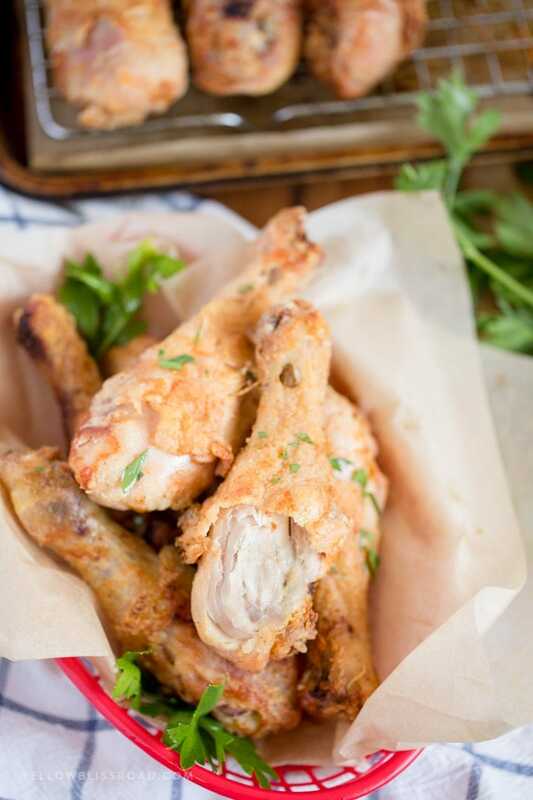 But if you’re like us and want to enjoy that crispy, juicy chicken more often, my Easy Crispy Oven Baked Chicken Drumsticks recipe is the way to go. Tons of people who love my Crispy Baked Chicken Wings have asked how the recipe would translate to larger pieces, like drumsticks. Well I’m here to tell you it works and it is delicious! I didn’t change the recipe much other than increasing the ingredients to account for the larger pieces of chicken. I also swapped out the paprika for chili powder because it’s what I had available. Coat chicken in flour/baking powder/seasonings. Use a wire baking rack oven a cookie sheet to ensure even crisping. Spray with butter flavor cooking spray before baking for that golden skin. The coating is a simple mix of basic seasonings, flour and baking powder. You could easily swap out the seasonings I used for anything you like. If you have poultry seasoning on hand that would certainly taste (and small) amazing. 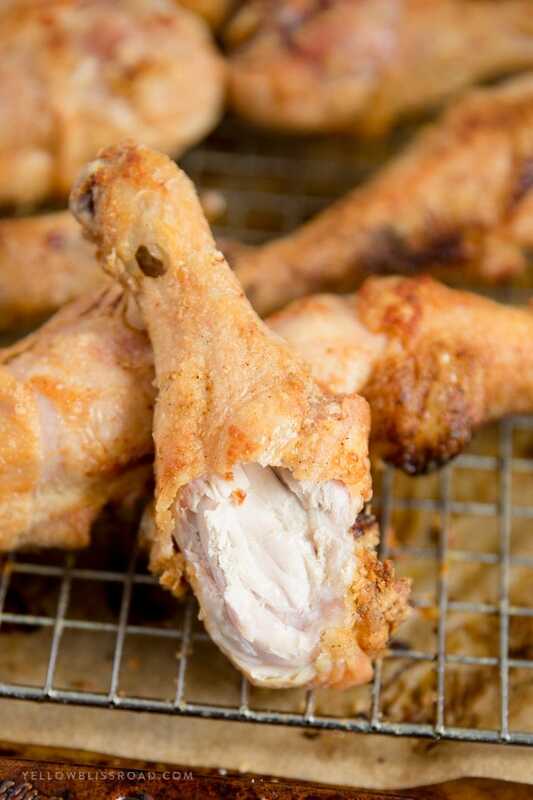 I like to keep my recipes simple, not requiring a ton of steps, but for even juicier chicken you could soak the drumsticks for a couple of hours in buttermilk. 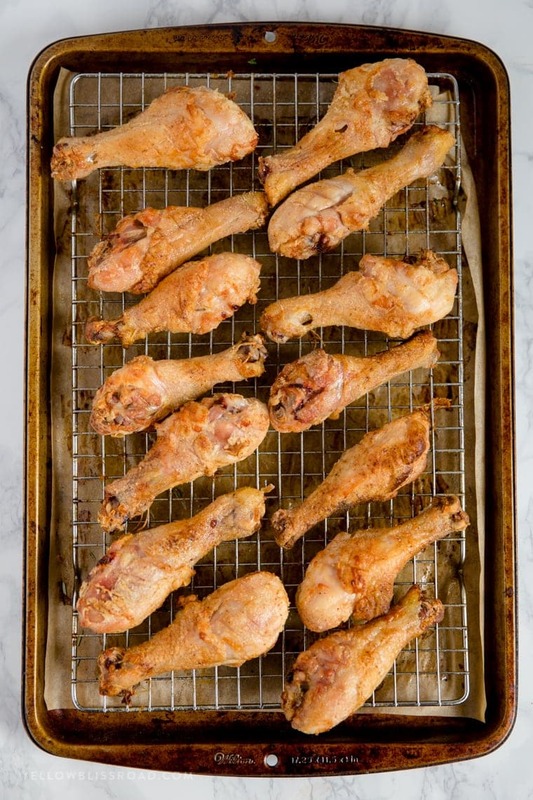 HOW LONG DOES IT TAKE FOR DRUMSTICKS TO COOK IN THE OVEN? While the coating will help the chicken retain some crispiness, I sprayed my drumsticks with a butter based cooking spray to help them get nice and golden and crispy and laid them on a baking rack over a cookie sheet. Spraying them instead of coating them in butter helps to keep the calories and fat down which is always a plus, especially when you’re talking about fried chicken! Preheat the oven to 425 degrees and bake the chicken drumsticks for about 40-45 minutes, turning them over after about 30 minutes. You’ll know they are done when the meat is no longer pink at the bone and the juices are clear. A meat thermometer inserted near the bone should register 165 degrees. 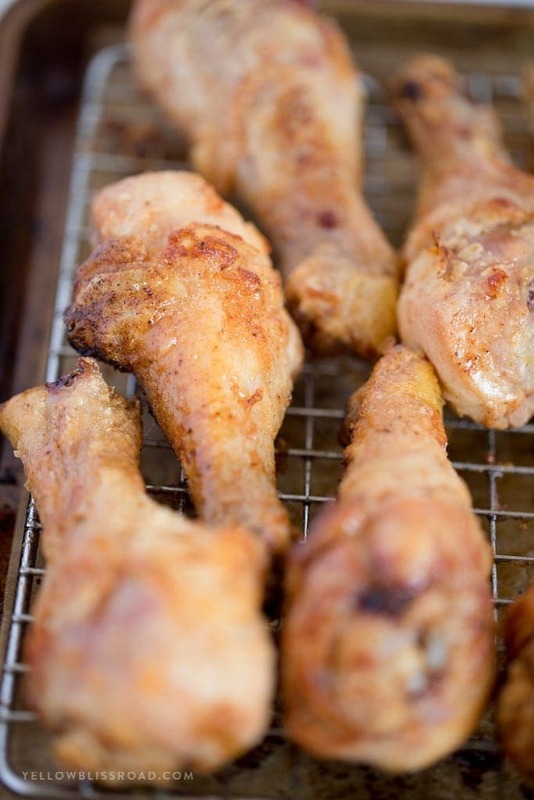 WHAT IS THE DIFFERENCE BETWEEN CHICKEN LEGS AND DRUMSTICKS? A chicken leg refers to the entire upper leg portion of the chicken, which is the drumstick and thigh. A drumstick is strictly the lower leg. Preheat oven to 425 degrees F. Line a large baking sheet with foil and set a baking rack on top if you have one. If you don’t have a baking rack just spray the foil with nonstick cooking spray. Pat chicken dry, leaving skin in tact, and set aside. In a large zip-top bag, combine flour, baking powder, salt, paprika and black pepper. Place the chicken in the bag a few pieces at a time and shake to coat. Set chicken pieces skin side down on the baking rack that has been placed on top of the baking sheet (or on the foil lined baking sheet that’s been sprayed with nonstick cooking spray). Place larger pieces toward the outside; pieces can be close together but should not touch. Spray pieces generously and evenly with butter flavored non-stick cooking spray. Bake in the preheated 425 degree oven for 45-50 minutes, turning over after 30 minutes. Spray again with the cooking spray after turning. Juices should be clear and temperature should register 165 degrees. If you are not happy with the color you can turn on the broiler for a few minutes, just watch closely to ensure the chicken doesn't burn. I have to make 70 drumsticks for a homeless organization. Would this recipe work for such a large amount of chicken? Yes I think it would work. I’d say work in batches, but if you have an industrial size oven you could cook more at a time. Yes, that should be fine. I usually have a little leftover depending on the size of each piece. Love it, Ann! Thank you! Kristin, on a lark, I only have 3 drumsticks and 5 thighs so I cut ( using the Chinese butcher knife) each thigh in half. I marinade them with some garlic powder, onion powder and a pinch of salt. Then, I proceed as usual using your yummy coating ingredients. In my humble opinion, the yumminess was elevated to another level! Your seasoning is spot on! I shared your recipe with my daughter, my neighbors …..Thank you very much again! Hey Kristin!! I’m super excited to try these out tonight!! I was wanting to brush on a sweet and spicy sticky sauce I bought. Do you think I should do in mid cooking or when they are done?? Can you tell I’m new to wings and drumsticks? haha Thanks in advance! I wouls say brush it on at the end, so they’ve had time to get that nice crispy skin. Enjoy! Hi! Thank you for the recipe! I’ll be making it tomorrow , just wondering. Do you cover the chicken with aluminum foil when it’s in the oven? Or will it cook ok uncovered? Thanks again! No, you want to leave it uncovered so the skin can crisp up a bit. Super crispy and the chicken was moist and delicious! I cooked them for a bit longer just to get an even crisp on both sides. Fiancé loved them as well definitely our new go to chicken drumstick recipe! Trying your wing recipe next! Thank you Courtney! So happy that you and your family loved this recipe! Thank you for this recipe! May I comment on the step involving the ziplock bag? It sounds very convenient, but I presume few people disinfect and reuse these. So this method for marinading food generates plastic waste that could be avoided- for example, by using dishwasher safe tupperware instead (IKEA sells cheap ones made of glass, even). Given the degree of plastic pollution in our oceans etc, might be worth a try. I’ve made these twice now and my family LOVES them! ? LOOKS SO GOOD, I AM GOING TO TRY IT TODAY. THANK YOU SO MUCH FOR SHARING YOUR RECIPE ON THIS SITE. I’ve necer heard of using baking powder in a coating for chicken. I am excited to try this recipe. Thanks for sharing. For any chicken recipe calling for baking POWDER (mind you, NOT BAKING SODA) MAKE SURE YOU USE ALUMINUM FREE BAKING POWDER. Normal baking powder has aluminum in it and doesn’t work well as it tastes funny. Argo brand is aluminum free which I’ve found at Walmart. There are other brands as well. The baking powder changes the pH of the meat and helps to crisp it up. Hmmm… Not sure what went wrong. I used boneless breasts but otherwise followed the recipe exactly. No flavor at all. Went with the backup plan and applied bbq sauce and the family ate it up. I didn’t expect a crispy exterior but I thought the dredge would provide enough flavor. The only thing I can think of is that the ingredients list kosher salt seperatly from salt but no quantity. Was I supposed to add more salt? 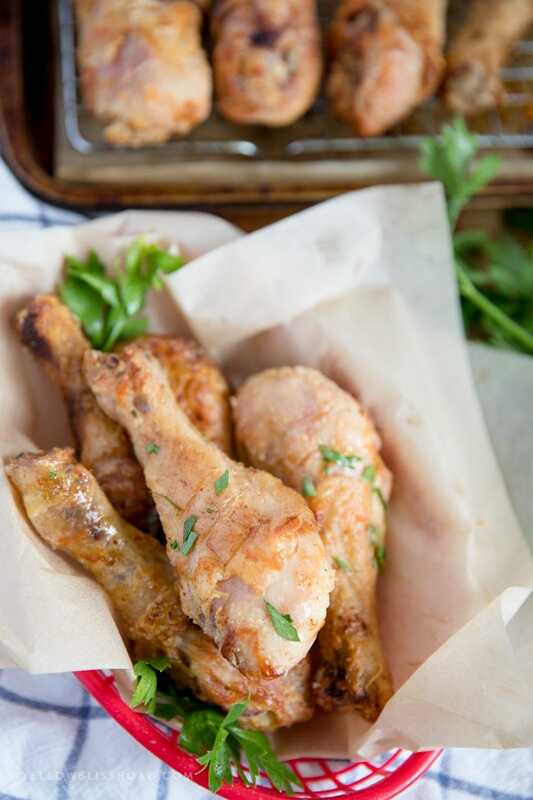 Chicken drumsticks naturally have a lot more flavor because of the fat and bone. Boneless breasts would not come out the same. Try my Baked Chicken Breasts – they are to die for! 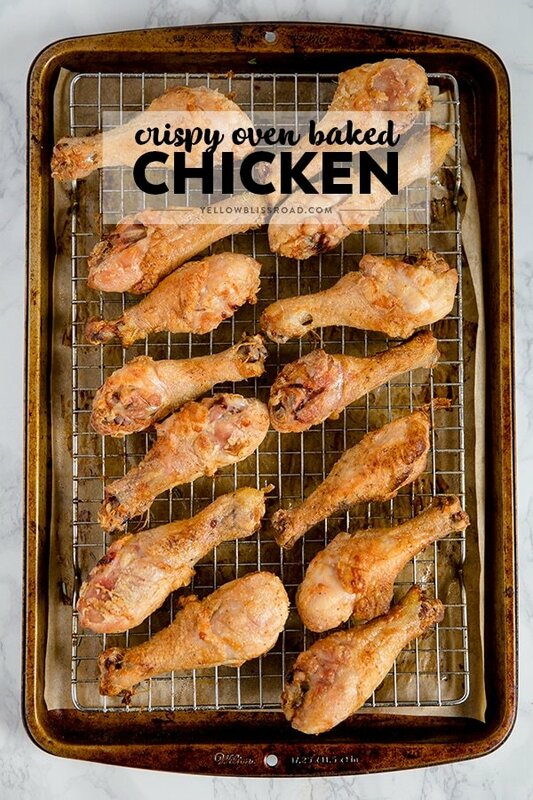 Decided to try this for dinner tonight and the drumsticks turned out great – really crispy and yummy! However I did notice some parts of the chicken tasted a bit powdery. Should I have shaken the flour off a bit before putting the pieces on the pan? I didn’t use cooking spray as suggested because I didn’t have any on hand but instead brushed olive oil. I’d love to do this recipe because it was gooood! TIA! Is there perhaps an alternative to the cooking spray? We don’t keep any in our house… any way around it? You could skip it altogether, or brush a little olive oil on top. It just helps get the chicken crispy. Thank you so much! I actually put a spray nozzle on our olive oil and they turned out great! in the ingredient list you only list chili powder but in the directions you mention paprika… so do you use chili powder or paprika? I feel there’s a definite difference between tastes depending on what you use! Good catch Carrie! I’ve used both, so when I wrote it I probably was thinking of both. I prefer paprika, but chili powder works great too. Thanks a lot Kristin I cooked this at the fire station and it was a hit! Firehouse #28 loves your recipes.? Yay! So happy to hear you all enjoyed this recipe. Thank you all for your service!! Holy smokes these came out crispy! Next time I’ll be more prepared and have buttermilk (and at least a couple extra hours) on hand, but I brushed these with a little homemade ‘hot chicken paste’ just after removing from the oven and they could not have turned out more terrific. Woow… looks yummy! Gotta try it soon. Thanks for the recipe! By far amaze balls! I hate to be he turd that adjusts and posts. But only thing I did was I didn’t g ave flour. So I super blended Pablo and added a sprinkle of sugar. But wholly cow, spot on on cooking time and spraying the oil. What a clever idea! Thank you!